His Kind of Woman is a 1951 American black-and-white film noir, starring Robert Mitchum and Jane Russell. The film features supporting roles by Vincent Price, Raymond Burr and Charles McGraw. The movie was officially directed by John Farrow and based on the unpublished story Star Sapphie by Gerald Drayson. Post-production on the film was rife with problems; RKO executive producer Howard Hughes was dissatisfied with John Farrow's work and a number of scenes were cut, added and re-shot by the uncredited Richard Fleischer, who had just completed The Narrow Margin for RKO. Hughes also organized a screenwriting team that included Fleischer and Narrow Margin's Earl Felton, which rewrote the film and added many pages to the first script. Down on his luck, professional gambler Dan Milner (Robert Mitchum) accepts a mysterious job that will take him out of the country for a year but pays $50,000. He accepts a $5,000 down payment and tickets that will take him to an isolated Mexican resort, Morro's Lodge, where he will receive further instructions. Milner is attracted to the only other passenger on his chartered flight to the resort, Lenore Brent (Jane Russell). When he arrives, Milner finds that several guests at the luxurious Baja California resort have hidden agendas. He is disappointed to find that Lenore is the girlfriend of famous movie actor Mark Cardigan (Vincent Price). Milner overhears two guests, self-proclaimed author Martin Krafft (John Mylong) and a man named Thompson (Charles McGraw), planning something which he suspects involves him. When Milner confronts them, he is given $10,000 and told that someone is on his way to Baja to see him. Seemingly drunk Bill Lusk (Tim Holt) flies in, despite warnings of very dangerous storm conditions. Milner thinks he must be the contact but when the two are alone, Lusk claims to be an undercover agent for the Immigration and Naturalization Service. He tells Milner that the U.S. government suspects that underworld boss Nick Ferraro (Raymond Burr), deported to Italy four years earlier, is scheming to get back into the country posing as Milner. The two men are a close physical match and Milner is a loner, so no one is likely to miss him. Krafft turns out to be a plastic surgeon. Cardigan's wife Helen (Marjorie Reynolds) and his personal manager Gerald Hobson (Carleton G. Young) show up. She had gone to Reno to get a divorce, though not really intending to go through with it, as she is still fond of her husband. Hobson also thinks it is a poor idea because Cardigan's film contract is expiring and the bad publicity would make it hard to get a new one. With her own plans ruined, Lenore confesses to Milner that she is really just a singer looking to hook a wealthy spouse. Milner shows his softer side when he helps unhappy newly wed Jennie Stone (Leslie Banning) by cheating at poker to win back her husband's gambling losses from investment broker Myron Winton (Jim Backus). Lusk sneaks into Thompson's room but is caught and killed. Milner and Lenore stumble upon his body dumped on the beach; Milner is convinced that the dead man must have been telling the truth. That night, Thompson and his men take Milner to a yacht, recently arrived in the bay. Milner is able to pass along a veiled plea for help to Lenore. She persuades Cardigan, who is tired of just pretending to be a hero, to help out. While the actor keeps the mobsters pinned down with his hunting rifle, Milner sneaks back onto the boat, knowing that the only way out of his mess is to deal with Ferraro once and for all. He is caught and brought to the crime lord. After killing two of the thugs and wounding and capturing Thompson, Cardigan mounts a rescue with the reluctant assistance of the Mexican police and a couple of the more adventurous guests. A gunfight breaks out aboard the boat, followed by a melee. Milner manages to break free and shoot Ferraro dead. Cardigan and his wife are reconciled. Milner and Lenore end the film in a clinch. The film was announced in July 1949 with Jane Russell and Robert Mitchum already attached. It was at one stage known as Star Sapphire. Robert Sparks was to produce and John Farrow to direct. The film was a rare RKO role outside of Westerns for Tim Holt. Filming took place in November 1950. In December they were doing retakes. Russell and Mitchum were promptly re-teamed in Macao (1951). RKO were so pleased with Price's performance they signed him to a non-exclusive contract as a writer and director. In May 1951 it was announced further retakes would be done for the film. Howard Hughes had bought RKO Pictures in 1948.Hughes asked Richard Fleischer to change and reshoot the ending, estimating that the reshoot would take ten days or two weeks. Fleischer reshot most of the film during post production, which he describes in detail in chapter five of his book Just Tell Me When To Cry. Story conferences between Hughes, Fleischer and the writer Earl Felton, took several months to complete. The changes added new action scenes on the yacht, a set of the bridge of which had been built for the original production. As action sequences were added in the rewrite, this set was expanded bit by bit to a set for a full size 150-foot yacht, including interiors. The yacht set was in a very large water tank on Stage 22 of the RKO Culver City lot, the biggest sound stage in Hollywood. A new scene involved the sinking of a rowing boat; "After the boat reached a certain point, it had to sink fairly slowly, the water coming up to the chins of the smallest seated soldiers". This required that the tank with the yacht set be emptied, have a portion rebuilt to deepen it to accommodate the sinking as scripted and be refilled. Another new scene involved a massive brawl. After two months of shooting and a month of editing, an hour and 20 minutes of new material had been added to the film. When Hughes viewed the new material, he decided that he did not like Ferraro's original actor, Lee Van Cleef and ordered the scenes with that character reshot with a different actor. (Robert J. Wilke was chosen for the reshoot after a careful search and screen tests); this second reshoot involved nearly every scene of the new material and a number of scenes earlier in the picture. Three quarters of the way through this second reshoot, Hughes saw Raymond Burr in a movie and ordered Wilke's scenes reshot using Burr. The reshoots cost about $850,000 to complete—approximately the amount of money which the film lost in its initial 1951 release. The film recorded a loss of $825,000. 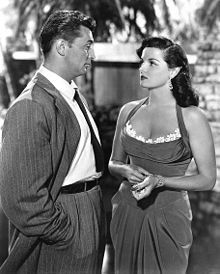 In a review of the film, the staff at Variety magazine lauded the pairing of Robert Mitchum and Jane Russell as the lead characters, writing, "[The] two strike plenty of sparks in their meetings as each waits out plot development ... Both Mitchum and Russell score strongly. Russell's full charms are fetchingly displayed in smart costumes that offer the minimum of protection. Much is made of Vincent Price's scenery-chewing actor character and much of it supplies relief to the film's otherwise taut development". Critic Dennis Schwartz called the film, "An oddball tongue-in-cheek crime thriller, filled with ad-libs, from Howard Hughes' RKO studio that strays from its conventional film noir plot to try its hand at comedy". Schwartz also appreciated the acting, writing, "It's a part where Mitchum is perfectly at home with being a loner anti-hero and Russell is perfectly cast as the bouncy 'his kind of woman', who in the last shot kisses him while his pants are being scorched by the iron--a perfect metaphor to end on". Linda Rasmussen liked Mitchum's performance but as a film noir proper gave the film a lackluster review, "As a serious film-noir thriller, it lacks suspense and depth. However, the film has its moments, and Robert Mitchum is in his element as the loner anti-hero". Jane Russell later said "It was a good film until they took John Farrow off and put in this nonsense at the end, the gore and [hypodermic] needles". ^ His Kind of Woman at the American Film Institute Catalog. ^ Richard Jewell & Vernon Harbin, The RKO Story. New Rochelle, New York: Arlington House, 1982. p259. ^ Variety. Staff film review, August 29, 1951. Last accessed: January 15, 2008. ^ Schwartz, Dennis. Ozus' World Movie Reviews, film review, December 15, 2004. Last accessed: January 15, 2008. ^ Rasmussen, Linda. His Kind of Woman at AllMovie. Last accessed: January 15, 2008. ^ Peary, Gerald (July 1992). "Russell". Film Comment (28.4 ed.). p. 31. Fleischer, Richard (1993). Just Tell Me when to Cry: A Memoir. Carroll & Graf Publishers. ISBN 978-0-88184-944-8. Wikimedia Commons has media related to His Kind of Woman.